Depending on the day I might name another film, but I always return to The Passion of Joan of Arc as probably the most powerful film I have ever seen. Its images are unbearable to watch and its story horrifying and breathtaking. It is that rare film that I would label an art film. But let that not dissuade potential first-time viewers. Passion is an experience unlike any other. It jolts complacent viewers out of their haze and forces us to actively witness the persecution of Joan of Arc by the men of her own faith, men of the same institution that would canonize her in 1920. Joan’s trial and imprisonment lasted nearly a month, immediately followed by a regular trial which lasted 2 months. Joan constantly faced her accusers and must have spent hundreds of hours alone in her cell, a hell I am not strong enough to handle. Dreyer has condensed the trial, or at least the dramatic and cinematic structure of his film creates a vacuum where it feels as if Joan’s suffering lasted mere hours. Dreyer was right to do this. In changing what we know of reality, he creates a most palpable experience of Joan’s ordeal, and we feel more readily her enormous suffering. This is not a religious film. It is not propaganda. The story might be significant to Christianity but it is also important to history. It is a document of a woman who believed and of the institution threatened by her power, heretics and hypocrites all. Dreyer does not argue that God exists. His characters all have their faith, but it is the will and nearsightedness of man that interests the director. Joan is never beyond human means, the clerics who judge her the same. The notion of holiness is non-existent. Prayers are never answered and religious symbolism is absent. Even a shadow of a cross is meant only to ease Joan’s nerves. The film does not infuse its images with a higher meaning. This creates an authenticity missing in traditionally religious films. The film is always about convictions. Even when Joan is paraded outdoors and we see her many compatriots clamoring for her release, these people believe in the abilities of this woman, not directly in a higher power. This gives the film a wider appeal and enhances the experience because a true work of art must be objective, otherwise its appreciation will always be marred by its bias. Dreyer is less preoccupied in converting his audience and more interested in documenting for himself an important personal point. Why do her judges cry when she recants her forced confession, sealing her death? Have they found someone with true faith? Do they despair at ending a life? Are they ashamed? Of themselves or of their actions? Joan is in a state of grace. I cannot recognize someone in this position but Joan’s serine expressions in the face of torture make me believe she is. A monk asks her, when trying to recant her recantation, of her great victory, implying it will die with her. Joan knows her martyrdom will bring about the victory God spoke to her of. Her death will prove to her wrongdoers the truth of her convictions. The film feels as if it were somehow never intended to be viewed by a movie audience. The way it is put together neglects, for example, clarity in visual storytelling—continuity, establishing shots, establishing for the audience where characters are in relation to each other and the room—Dreyer is not interested in such concerns. Dreyer originally intended the film open without credits. Imagine what that would be like in a theater, where we sit down and the film begins for us. When the lights darken, history opens up on the screen. The experience wouldn’t work on home video. It must have a jarring effect, and I must side with the director when he argued that audiences must be stripped of all clues of artifice. Credits tell us we are seeing a play. Dreyer’s original intentions, ignored throughout the years, would begin the film exactly as it should and as it continues throughout: jolting the viewers. There is only one point-of-view shot, only one moment when the film functions as traditional cinema. Joan looks on the floor and we see that she sees the shadow of a cross created by the window panes. The rest of the film is filled with images that lack continuity. Characters constantly look at each other and each new shot shows something different from the view point of who-knows-where. Every shot creates a disorienting effect. There’s an almost abstract shot as Joan is burning. The soldiers guarding the judges are preparing for retaliation. Maces are dropped to them from the windows of the towers, and this shot swings back and forth like a pendulum, ticking down to Joan’s ultimate victory. Often times the images suggest characters are literally on top of each other: Joan looks at the top edge of the frame and we then see a shot of a judge who is facing Joan. We know they are looking at each other but the images defy our understanding of cinematic language. There is a shot close to the end of the film that reminds me a lot of Eisenstein’s Battleship Potemkin. It’s of a man without legs wheeling himself around on a cart. A similar image exists in Potemkin on the Odessa steps. I am struck by the documentary-like qualities such images of human deformation have in our times. We in the civilized world cannot imagine anybody disabled to such a degree. We are away from wars, and in our society we’ve become so jaded that we turn the other way at the suffering of the homeless or, more surprising, strangers on the streets. These images, we’d like to believe, are fake, but Dreyer uses grim reality to recreate a grim tale. There’s an equally disturbing shot of Joan’s arm being bled. Apparently it is a real arm being pricked and real blood pulsing out. Because films today are all artificial, truth belongs to another time. While the film itself is an artifact these images make the film feel like war footage shot during Joan’s time. Another image I link with these is the horrifying shots of Joan’s burning body. The flames are so thick, but there looks as if a real face is in the fire. I swear I can see a nose with flames shooting off it. I know, at least I have to believe, that Dreyer did not burn a human being, not even a corpse, but the authenticity of the whole experience made me question what was actually burnt during the making of the film. Why make a film like this? It feels reactionary, like a battle cry from the director against the religious persecution of the innocent and against the banality of artistic convention. Passion defies it, giving its audience the visceral experience of its subject matter. It does something no other film is capable of. It demands attention and holds us spellbound until the final, bleak images of Joan’s death. At the center of The Passion of Joan of Arc is a remarkable performance by Renee Falconetti. I hope I can express myself better than others who simply state that it is the greatest performance ever recorded on film. I don’t deny this, only find that the phrase itself is not enough to describe Falconetti as Joan and it shortchanges her brilliant accomplishments. First I must say that she never appeared in another film. Roger Ebert correctly argues that because history is not saturated with her face that in this role she has become eternal. Ingrid Bergman in the same role is Ingrid Bergman. Falconetti’s haggard appearance, her masculine or rather unglamorously feminine face, has become the image of Joan of Arc for all time. On her face is written the real account of the ordeal as if we’ve been given a photograph, from a time before such alchemy, of Joan. Falconetti delivers what seems contradictory to the medium of silent film—a naturalistic performance. Look at the very best of silent cinema. To compensate for a lack of booming voice, actors usually chewed the scenery to make their points. They became larger than life. Falconetti at first is very expressive with her eyes. When she is first questioned, her eyes are wide, almost as if entranced by God. As I saw this recently for maybe then 8th time, I noted that in her first scene she is slightly artificial. I can think of two reasons why: perhaps in Falconetti’s reading of the events, she believes that Joan would be proud and vital, that she would stand up boldly to her accusers. It’s an appropriate tactic. I think the reality might be a bit different, and it is my second assumption: the film was shot in chronological order, and I think the strain by the strident Dreyer forced Falconetti to give the performance she gives, but this also undermines her efforts, but I think it’s practical to consider this. Very quickly any notion of artifice is gone. There are some shots where only the slight turn of Falconetti’s head is enough to convey Joan’s plight. Her performance is truly unique. I saw the film recently at Harvard, an archival print taken from the Cinematheque Francaise’s 1980s restoration. It featured no musical accompaniment. I viewed the film exactly as Dreyer would have wanted. The Criterion DVD features the silent soundtrack, but also offers Richard Einhorn’s fantastic musical piece “Voices of Light”, a project inspired by the film. I love Einhorn’s score. I’ve seen the film several times with it. I even listen to it on my iPod, but my viewing at Harvard was the first time I saw the movie silent. It has a special quality without music. Einhorn’s music dictates a certain pace to the images, and often drives the film. Without music I was able to focus on the images. I found myself involved in the movie in ways I never was before. Without my secondary sense at play, my eyes studied the screen, and everything I needed to know was shown to me to great effect. The film does not need music, let alone dialogue or sound effects. Words don’t matter. Faces tell all. The sounds of the cracking fire during the burning exist in the frame. Hearing them actually will not help at all. Silence is the perfect accompaniment to the film. It is most powerful. Most movies don’t seem to matter anymore after seeing The Passion of Joan of Arc. Perhaps this is because few films of its kind have actually been made. It is proof that elegant cinematography and precise editing do not qualify a film as art. This way of thinking links cinema closer to painting. The cinema is more rugged, less formal than that. 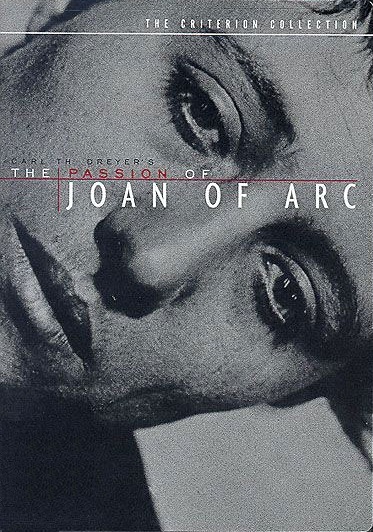 What makes The Passion of Joan of Arc a work of art rivaling the works of da Vinci is the absolute visceral experience the film is to sit through—the passion with which the story is told. We are disoriented by Dreyer’s imagery and cannot escape it. It is such a powerful experience that the image of Renee Falconetti as Saint Joan will be with me until the end of my life.